Pelvic pain or discomfort is very common during pregnancy. Symphysis pubis dysfunction (SPD) is also fairly common during pregnancy. If you’re feeling pain in the pelvic area, you may be experiencing SPD, caused by relaxed and stretchy ligaments that normally keep your pelvic joint (the symphysis pubis) aligned. Why Does Pelvic Pain in Pregnancy Happen? Your body produces a hormone called relaxin, which softens your ligaments in order to help your baby pass through your pelvis. Pelvic pain during pregnancy is thought to be caused by a combination of these hormones as well as the way your body moves. If one side of your pelvis moves more than the other when you walk or move around, the area around the symphysis pubis becomes tender. The main solution for pelvic pain during pregnancy is to stay on top of your Kegel exercises and pelvic tilts, which will strengthen the muscles in that region, and if pain is severe, ask your practitioner for a referral to a physical therapist. (Click here to read the Baby Chick article on 4 things every mom must know about her pelvic floor and core). In addition, here are a few more simple ways to reduce pelvic pain during pregnancy. Strengthen the core + pelvic muscles. Exercises, especially focused on your core and pelvic floor muscles. These will improve the stability of your pelvic floor and tummy exercises. For example, get down onto your hands and knees and level your back so that it is roughly flat. Breathe in and then as you breathe out, squeeze in your pelvic floor muscles and pull your belly button in and up. Hold this contraction for between five and 10 seconds, breathing through it. Relax your muscles slowly at the end of the exercise. 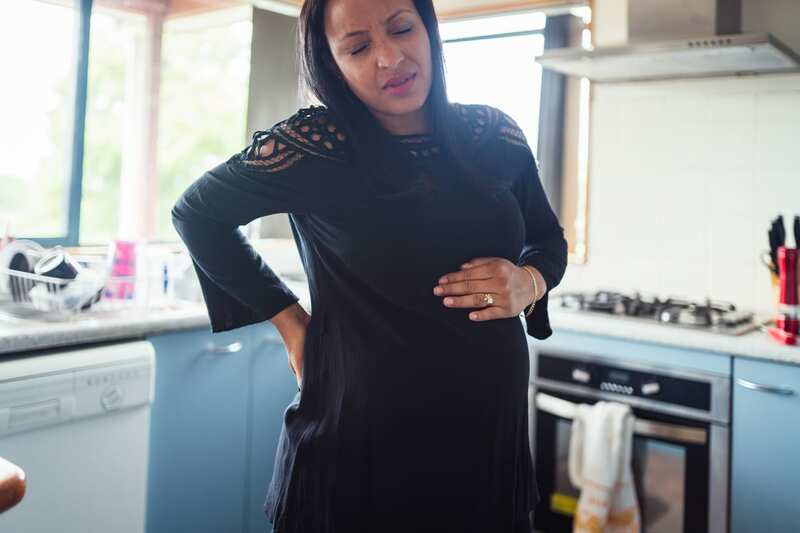 It sounds silly, but if your experiencing pelvic pain during pregnancy, try not to move your legs apart when your back is slumped or when you are lying down. If you are lying down, pull your knees up as far as you can to stop your pelvis from moving and make it easier to part your legs. If you are sitting, try arching your back and sticking your chest out before parting or moving your legs. Use wisdom & rest when you need to. Don’t push through your pain. If something hurts, stop doing it. If the pain is allowed to flare up, it can take a long time to settle down again.